Fashion and its contribution is regularly overlooked in history. Often viewed as frivolous and without significance, its importance is not always understood. Historian Amber Butchart’s new book, The Fashion Chronicles: The style stories of history's best dressed, is full of proof and truths about the impact it has had since man first began adorning themselves in clothing. Butchart’s new book covers ancient to modern figures that cross gender, cultures, and continents. Some of the subjects I knew and some I didn't. Some I had heard of, but wouldn’t have readily associated them as fashion icons. The Fashion Chronicles is full of anecdotes, like how the modern necktie originated in Croatia, that make it not only informational, but entertaining to read. With their stories, Butchart also includes several themes about how fashion was, and is, used to convey ideas such as status, wealth, political affiliation, and perceived intelligence. It is interesting that there are so many written accounts from journalist and personal diaries on their current state of fashion. More proof that throughout history people have taken note and understood the significance apparel has had on society. Today we see modern designers taking inspiration in the clothes we all wear making the history of fashion important today and for the future. Prior to my arrival, I knew that Miami, Florida was famous for its white sand beaches, great food, and graffiti, but I quickly learned that it is also famous for its humidity. Even so, in between spicy tacos and sunny boat rides, I managed to do a little shopping in South Beach. On an oppressively hot Tuesday, I walked into the Effusion Gallery on Ocean Drive located just a few steps from the Versace Mansion. Known for pop, art deco, and whimsy, I took some time to browse their selection and procure a print from the King of Pop Art, Nelson De La Nuez. He’s an artist known for blending iconic pop culture images, as he did with the classic Chanel #5 perfume bottle. There were several different sizes and designs of which I chose this small piece that measures roughly 7 x 9 inches. I was drawn to this particular color combination possibly because of the shade of blue, but it was most likely the newsprint. I mounted the print in an oversized metal frame and it now hangs in the entry way of my daughter's nursery. The print was purchased before she was born, but at a time when I’d hoped I would one day have a little girl to give it to. I do hope she likes it. 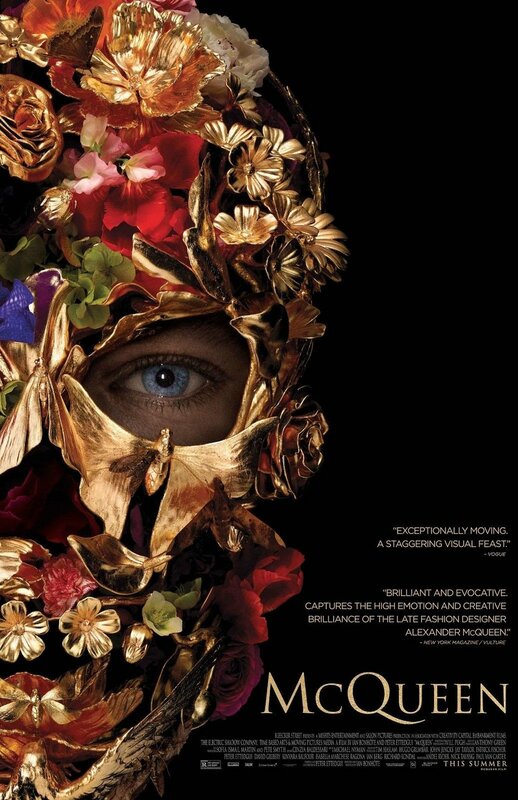 Next in line of great fashionable films come McQueen, a documentary directed by Ian Bonhote and Peter Ettedgui about the extraordinary life and career of Lee Alexander McQueen. Being one of my favorite designers, I've read and reviewed books about him before, but with this, I found there was more to learn. Full of jewel encrusted skulls and gilded wings, McQueen is the film we've all been waiting for.